BÉCHARD, Henri and Pascal SEBAH. 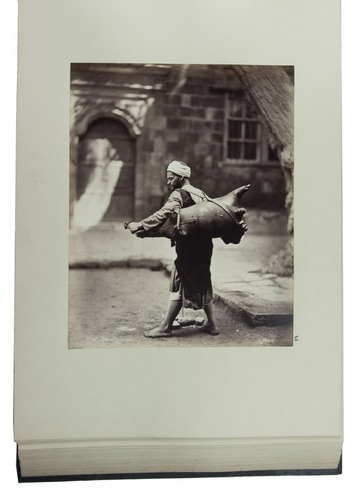 [Cairo & Istanbul, ca. 1870-1880]. 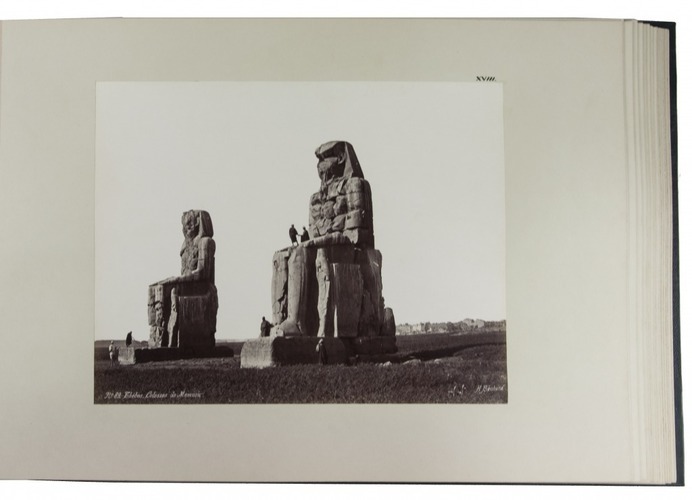 3 oblong photo albums (31 x 45 cm), containing 112 stunning photographs of Egypt (mostly measuring: 20.5 x 26.5 cm, some slightly smaller: 20 x 25 cm and some slightly larger: 26.5 x 21 cm), all mounted paperdboard leaves measuring 30 x 42 cm. 49 photos are signed, in the negatives, by Béchard, 35 by Sebah and 28 are unsigned, and several have numbers and titles as well. 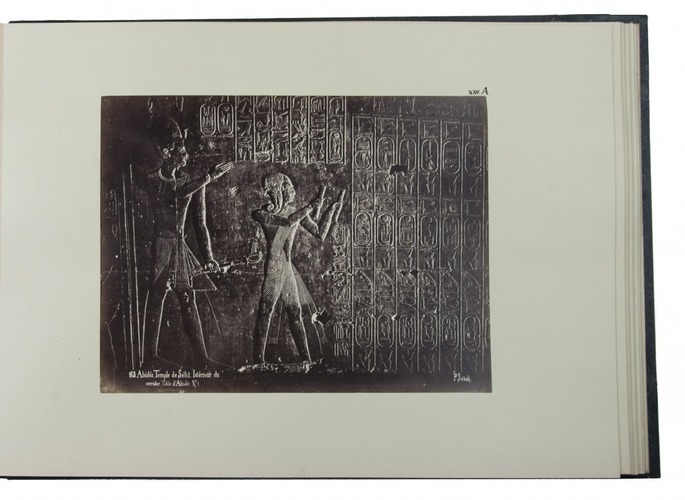 The photographs in each volume are numbered in a later hand on the leaves (48, "19"[=21], 43). Near contemporary gold-tooled black half morocco; kept in matching half morocco boxes. 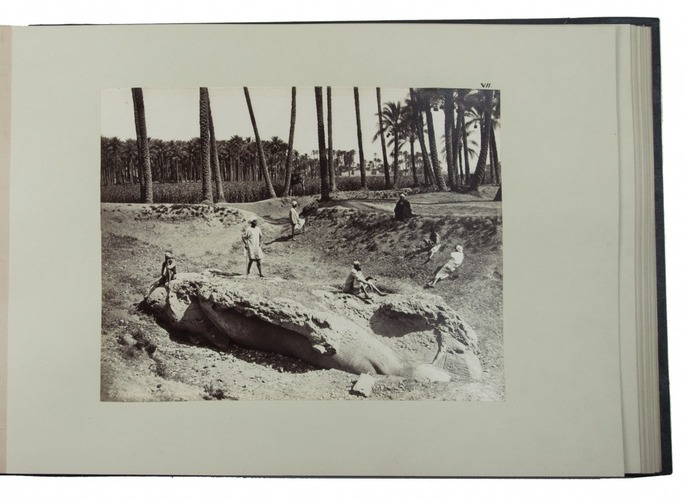 An extensive set of stunning photographs of Egypt by two of the most distinguished photographers of the Islamic world: Henri Béchard and Pascal Sebah. The collection is very well preserved and unusual in its scope. 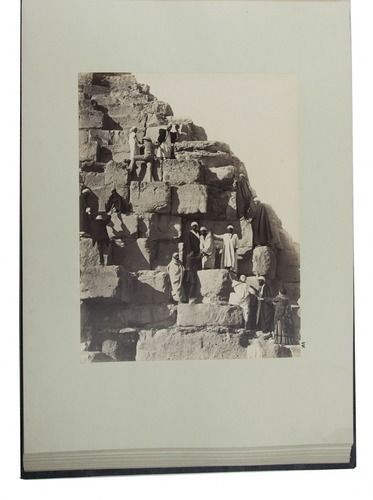 The volumes are thematically divided: the first album shows Cairo and daily life in the city, the second shows antiquities outside the city (pyramids, temples, funeral chambers, hieroglyphics etc. 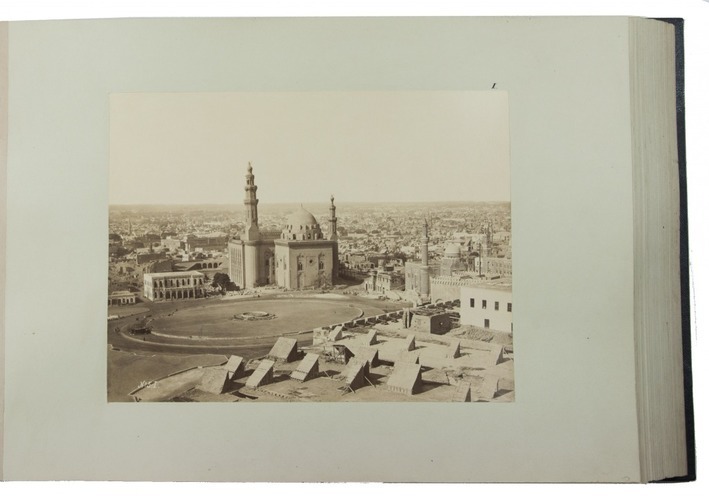 ), and the third shows cities other than Cairo, e.g. 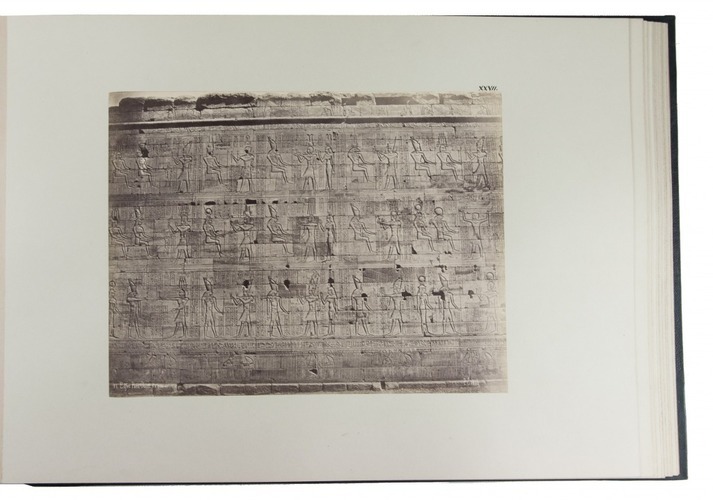 Karnak, Louqsor, Bal el Molouk, Thebes, Edfou, Assouan, etc., along with ruins and other sites from those places. 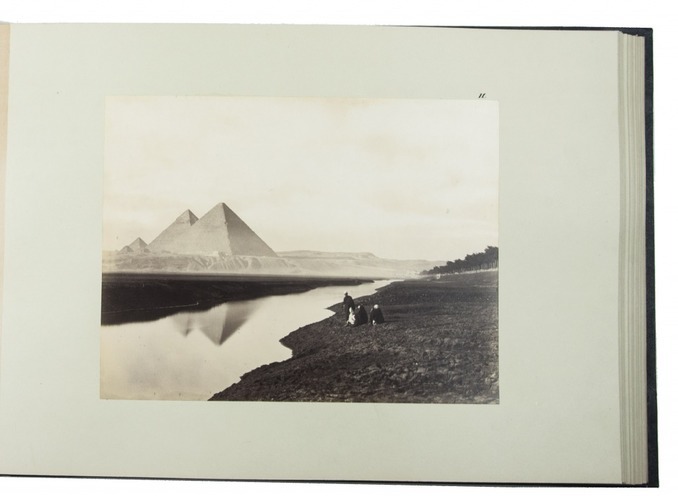 The photographs therefore not only show us the famous views and antiquities, but also give an acute portrayal of Egypt as a country and its everyday life at the time, which is not common in the usual touristic photo albums. Henri Béchard (active 1870-1880) was awarded the Gold medal at the Universal Exposition in 1878. 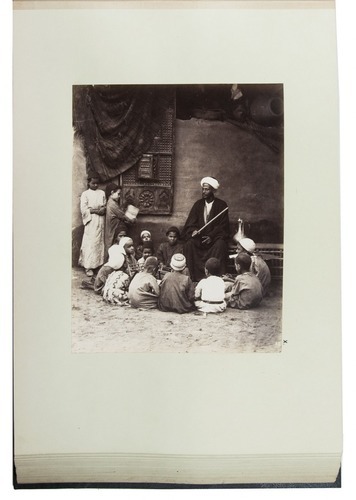 His studio was in the Ezbekiyeh Gardens, Cairo. 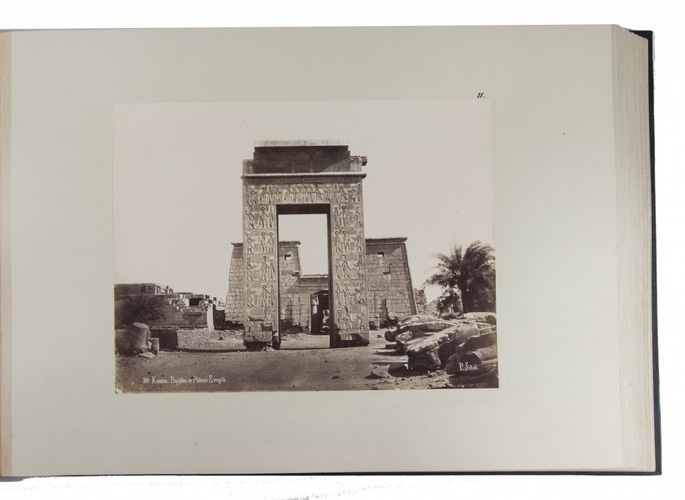 "His work is distinguished by the superb quality of his prints and the generally spectacular presentation of even the most common sites, such as the pyramids. 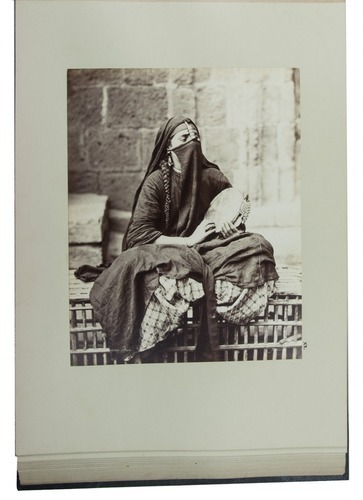 His studies of people and costumes are even more interesting and point to a very personal involvement of the photographer in the life and customs of the country. His cityscapes and urban scenes were mostly taken from unusual angles in an attempt to cope with the narrow and confined spaces" (Perez). 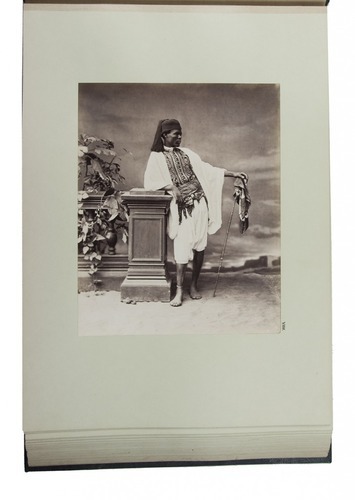 Pascal Sebah (1823-1886) was a leading photographer based in Constantinople, who catered to the Western European interest in the exotic "Orient" and the growing numbers of tourists visiting the Islamic world who wished to take home images of the city, ancient ruins in the surrounding area, portraits, and local people in traditional costumes. "Sebah rose to prominence because of his well-organized compositions, careful lighting, effective posing, attractive models, great attention to detail, and for the excellent print quality" (Saretzky). 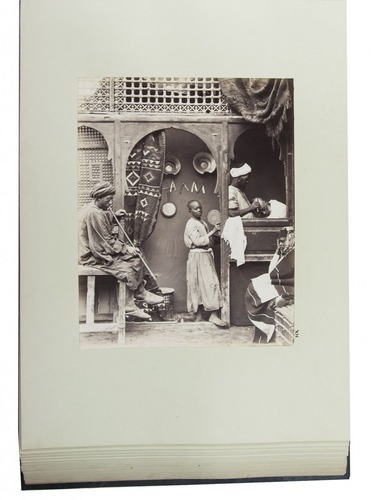 Only an occasional speck on the album leaves, otherwise a fine copy, with the photographs of a very high quality. The bindings also fine, only the boxes have some very minor wear along the extremities. Cf. N. Perez, Focus East (1988); G. Saretzky, History of photography (online).